The OSHA Silica standard has been in effect since September of 2017—learn more about it at 3M’s booth at World of Concrete. The standard is detailed, and you may still need to make adjustments to your company’s safety plan as well as update your personal protective equipment inventory. Do you still need help accomplishing these tasks? Since 1975 World of Concrete has been the industry-leading annual international event dedicated to the commercial concrete and masonry construction industries. This five-day event features indoor and outdoor exhibits where more than 55,000 registered industry attendees are exposed to new technologies, products, demonstrations, competitions, education opportunities, and information that can help sustain and grow their businesses. For safety managers, companies and workers who are still seeking to understand the new silica regulation and what it means for their businesses, we will be on site to meet with you and to discuss our safety products and engineered systems. We can also answer questions you may have pertaining to silica, including providing you with various resources and PPE to help you comply with the OSHA standard. In industries affected by this regulation change, exposures must be assessed and the possible need for respiratory protection determined. If you need to make changes in terms of respirators being used or if you need fit testing conducted for employees, we can help. Our specialists will be on hand to answer questions and to provide helpful information and insight regarding the new silica regulation. One additional advantage of PAPRs is that no fit test is required when used with loose fitting headgear. All tight-fitting facepieces, including disposable and reusable respirators, require you to be fit tested once a year. In some situations, loose-fitting PAPRs also allow workers to have limited facial hair versus a clean-shaven face when tight-fitting respirators are used. At World of Concrete, you can discuss these safety benefits with our specialists as well as gain insights to help you decide what respiratory option to use to protect your workers from silica exposure. We will be on hand to demonstrate our products, but you can also find information by visiting our OSHA Silica Regulation Update. Have You Heard What Else Will Be Available at World of Concrete? In construction areas where drilling is happening and silica may be present, you might want to consider full brim earmuffs. This option helps people communicate from heights, hands-free, and from a phone, and can help promote a safer, more productive worksite. 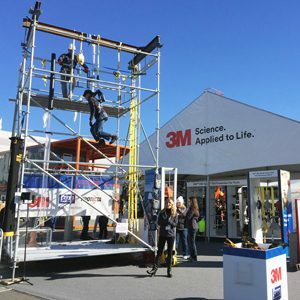 Visit our fall protection tower to learn about fall protection self-rescue and see dropped object demonstrations (not familiar with dropped object hazards – check out our blog). We will also showcase our safety equipment to help protect your workers at height and on the ground. If you are able to make it to World of Concrete, we encourage you to visit us at our booth #O30325 in the Silver Lot. Taking place in Las Vegas, Nevada, from January 22-25, there will be a myriad of informational opportunities at our booth. If you can’t join us, but still have questions about silica exposure and protecting your workforce, please do not hesitate to reach out to our technical specialists. ‘Cause it’s Gonna Get Loud!